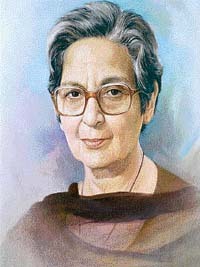 Amrita Pritam (31 August 1919 – 31 October 2005) was a Punjabi writer and poet, considered the first prominent woman Punjabi poet, novelist, and essayist, and the leading 20th-century poet of the Punjabi language, who is equally loved on both the sides of the India-Pakistan border. With a career spanning over six decades, she produced over 100 books, of poetry, fiction, biographies, essays, a collection of Punjabi folk songs and an autobiography that were translated into several Indian and foreign languages. 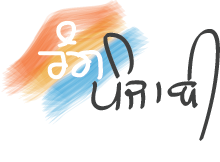 Amrita is the first recipient of Punjab Rattan Award conferred upon her by Punjab Chief Minister Capt. Amarinder Singh. She is first woman recipient of the Sahitya Akademi Award in 1956 for Sunehey (Messages), Amrita Pritam received the Bhartiya Jnanpith Award, India’s highest literary award, in 1982 for Kagaj te Canvas (Paper and Canvas). She received the Padma Shri (1969) and Padma Vibhushan, India’s second highest civilian award, and Sahitya Akademi Fellowship, India’s highest literary award, also in 2004. She received D.Litt. honorary degrees, from many universities including, Delhi University (1973), Jabalpur University (1973) and Vishwa Bharati (1987). In her career spanning over six decades, she penned 28 novels, 18 anthologies of prose, five short stories and 16 miscellaneous prose volumes.